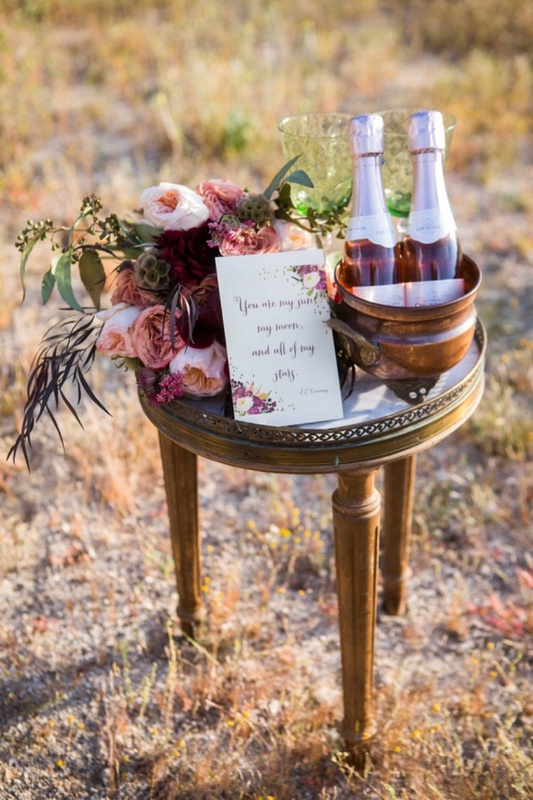 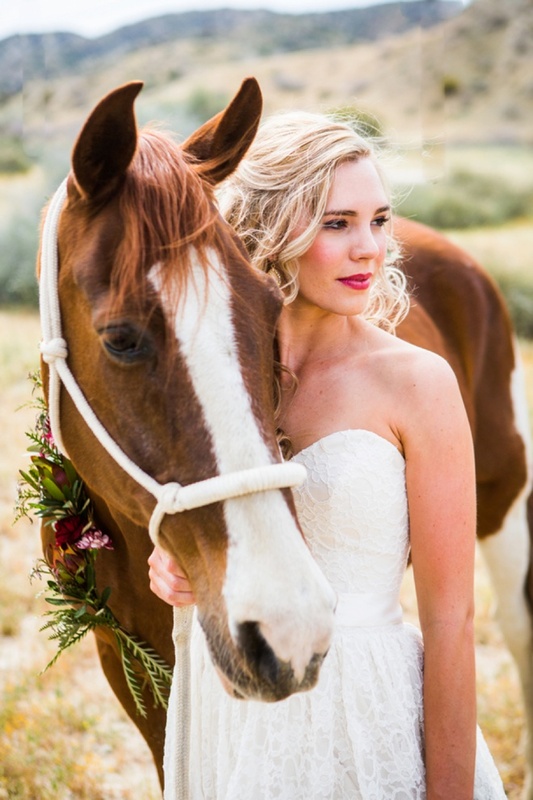 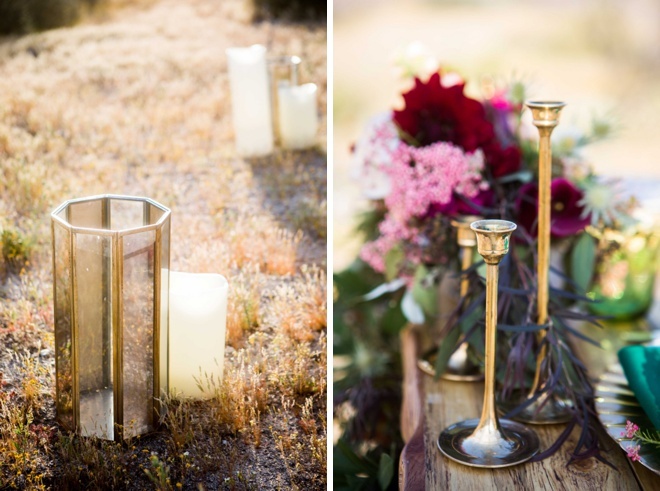 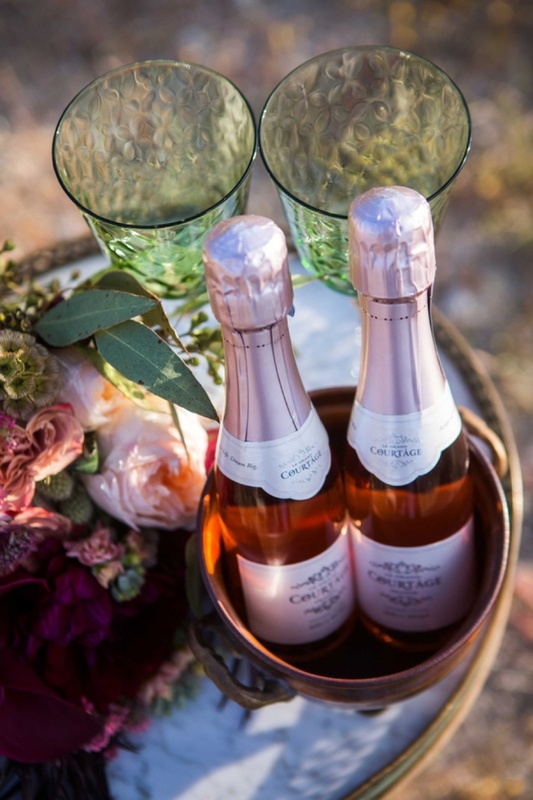 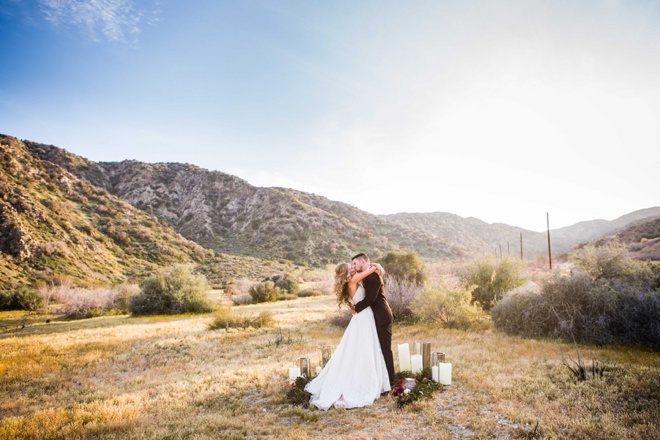 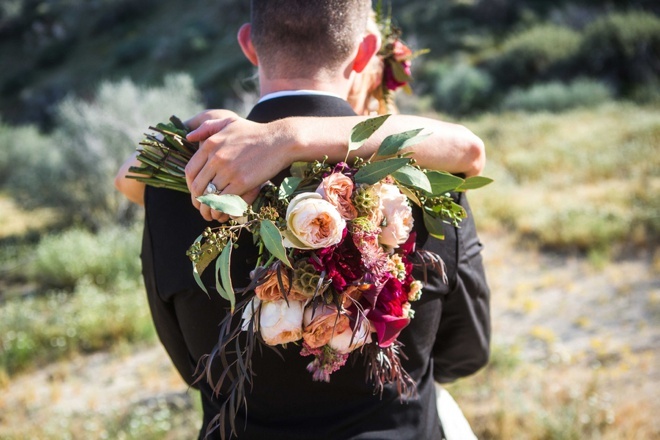 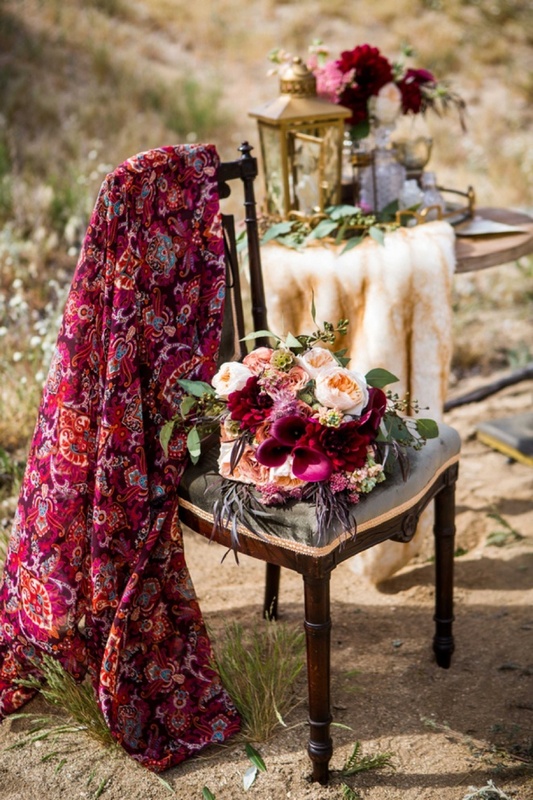 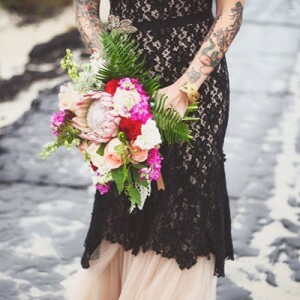 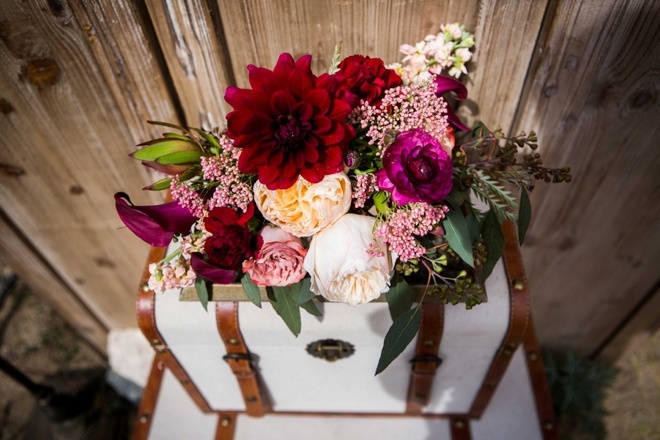 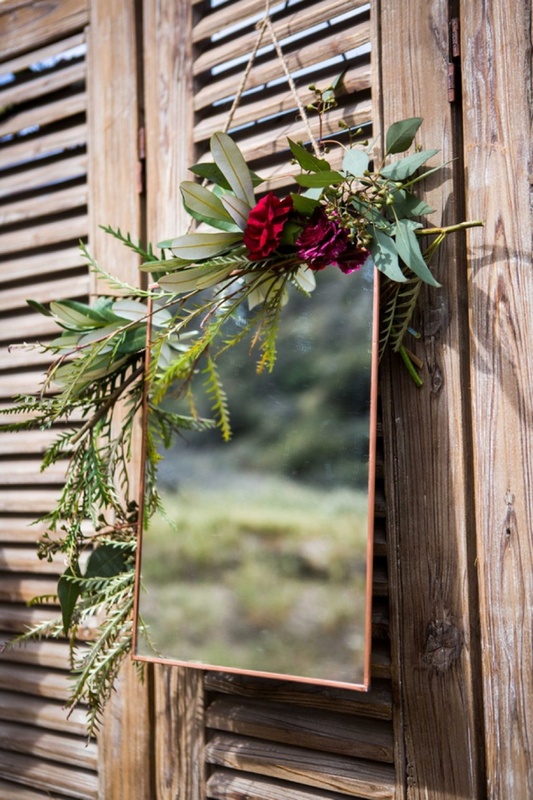 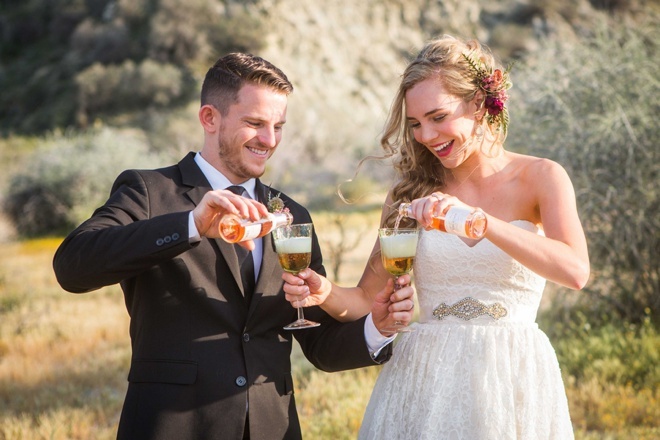 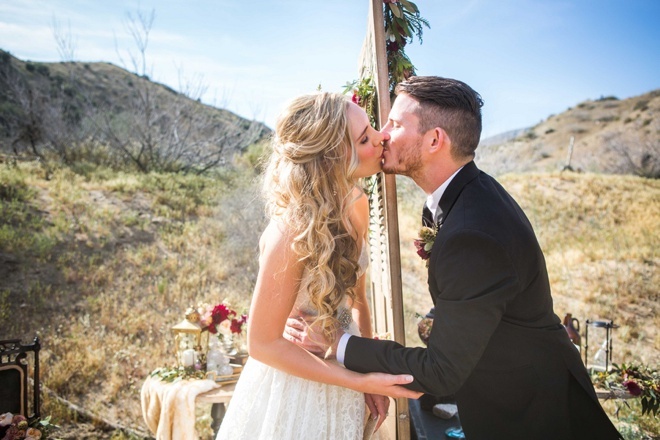 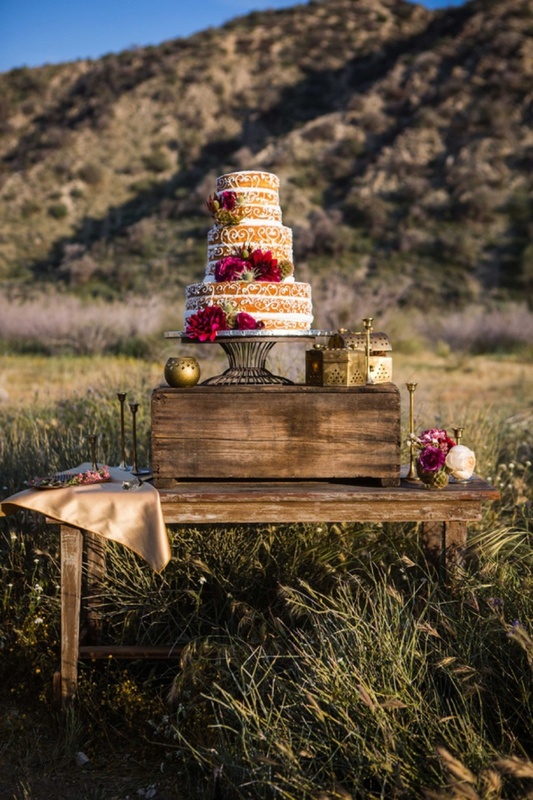 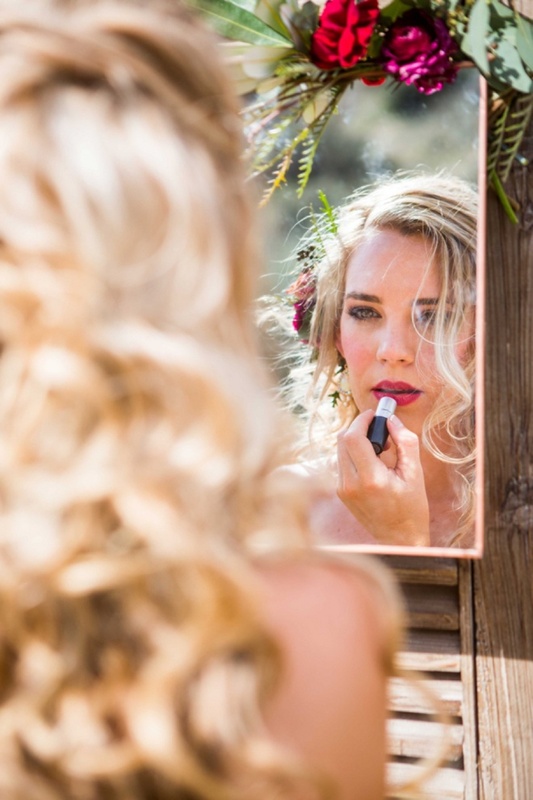 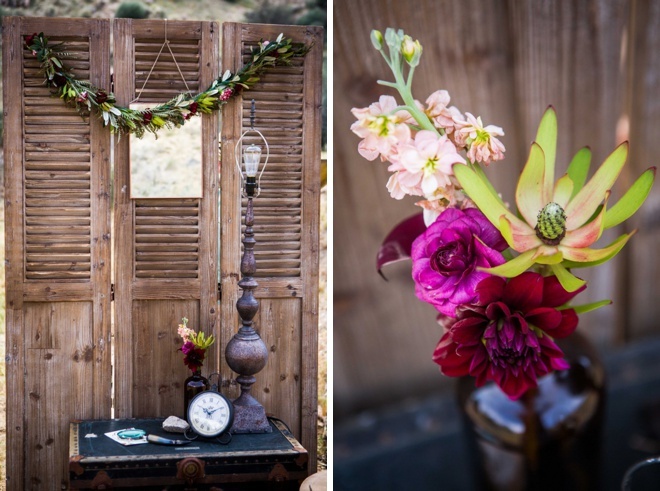 Gorgeous, early fall desert elopement inspiration! 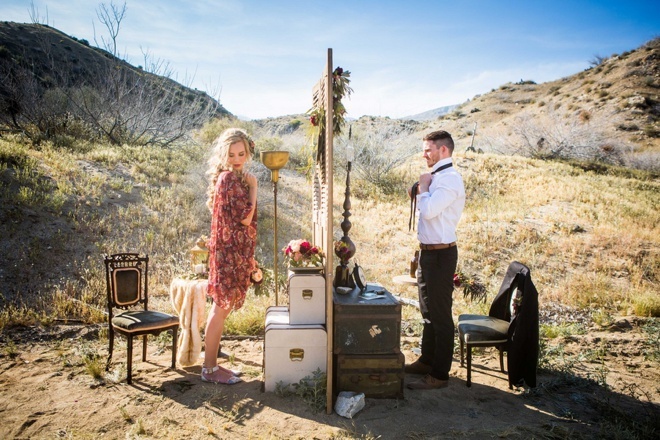 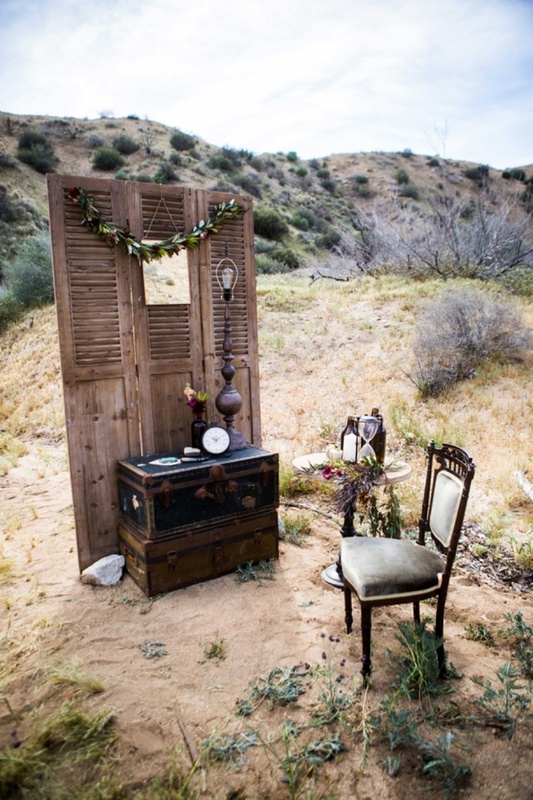 From Larissa Bahr Photography; I have wanted to do an elopement-styled shoot out in the high desert for some time. 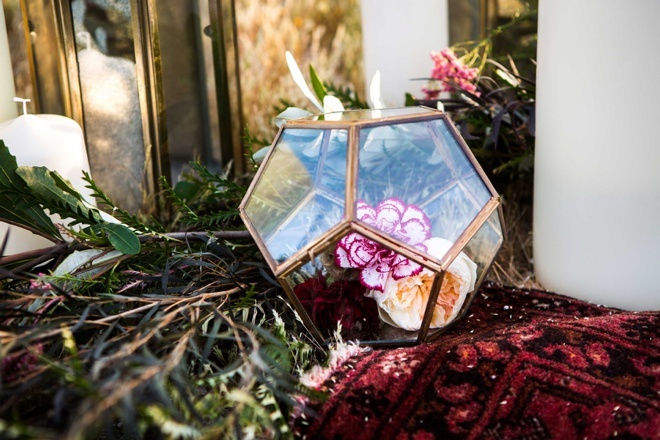 I had the privilege of teaming up with both Cassie Howard, of Events by Cassie, and Jessica Westervelt, of with SWD Floral, to turn this vision into a reality. 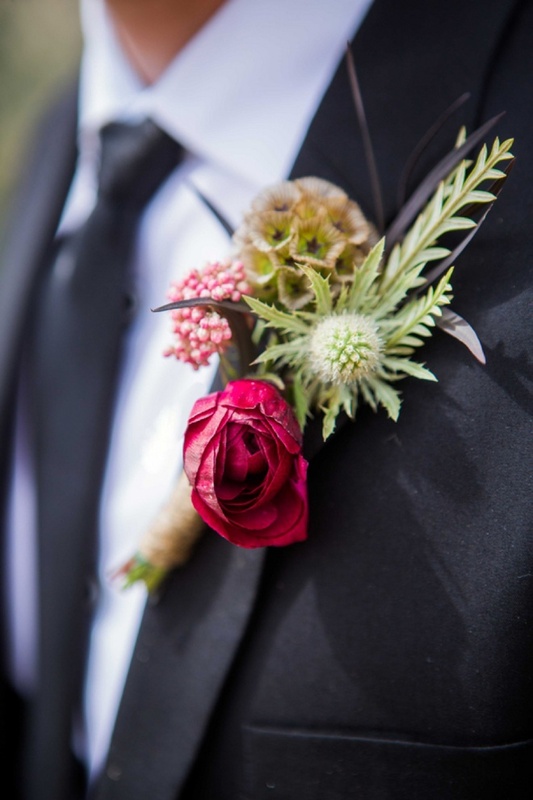 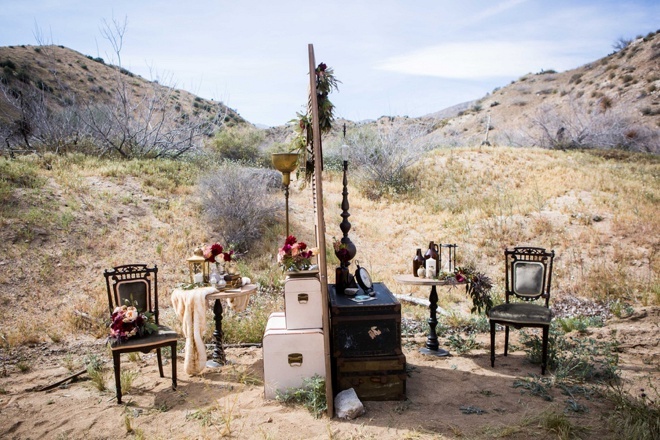 Our goal was to keep the raw, wild beauty of the desert, but also add in the soft elegance and style of a wedding. 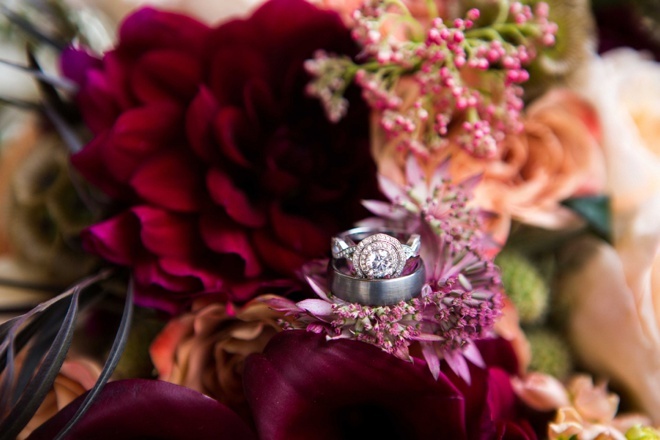 Cassie took charge of finding the rentals and partnering up with Jake Duke Rentals and Sweet Salvage Rentals to find what we would need to make our vision happen. 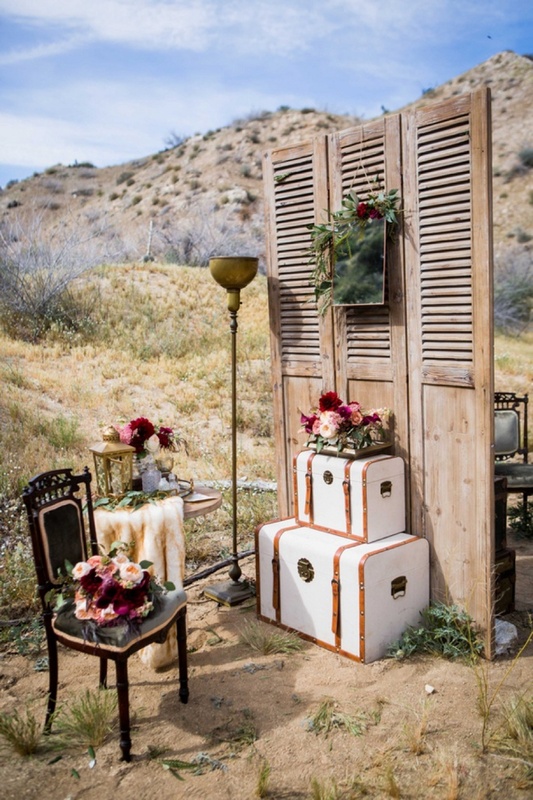 One of our biggest visions was the getting ready area for our bride and groom. 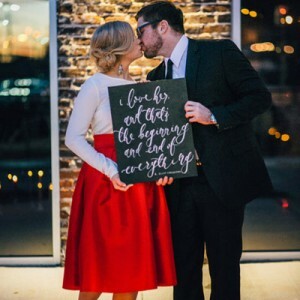 We chose a wooden divider to separate a “His” and “Hers” side with each themed appropriately. 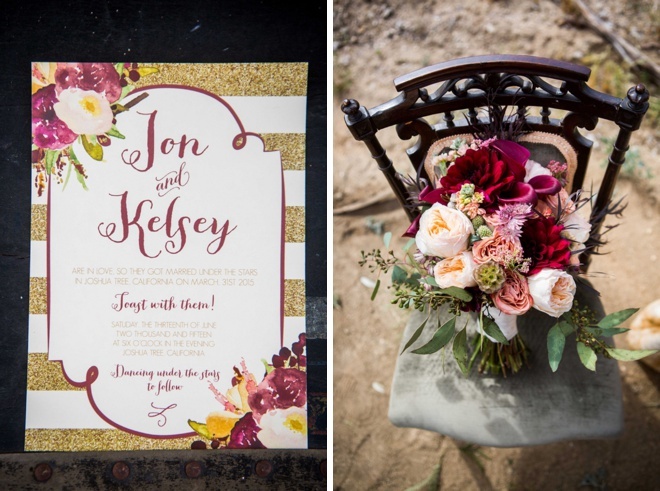 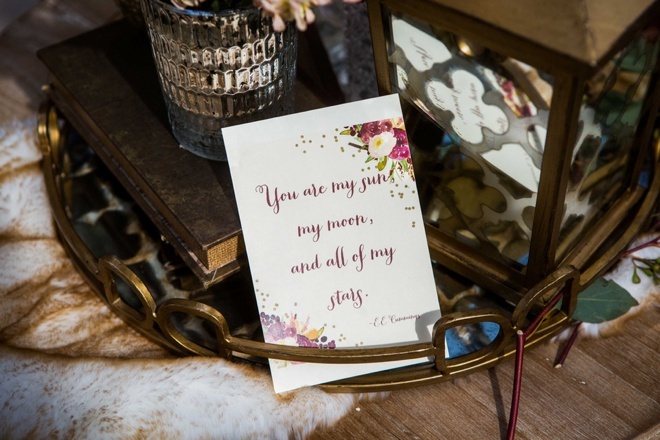 Each area had their own chair and table with a decidedly more light, flowery, and delicate bridal side and a darker hue, rustic, manly groom side. 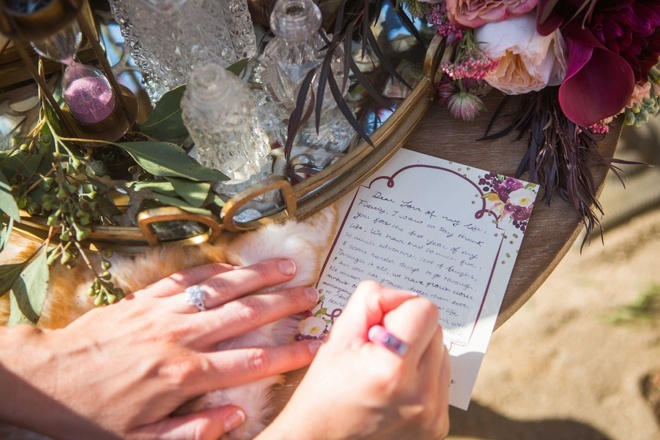 Stationary adorned the tables where our bride and groom could write notes to one another before the ceremony. 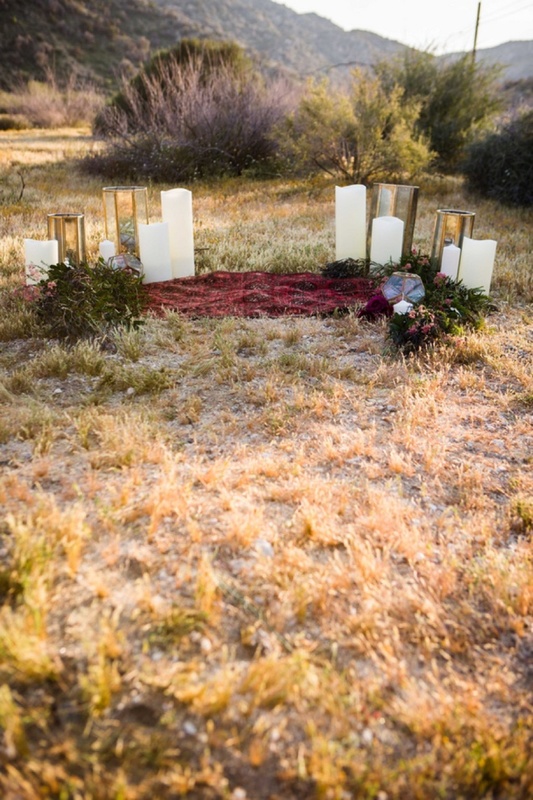 The ceremony site was completed by an assortment of candles, floral, and garland lining a bohemian styled-rug. 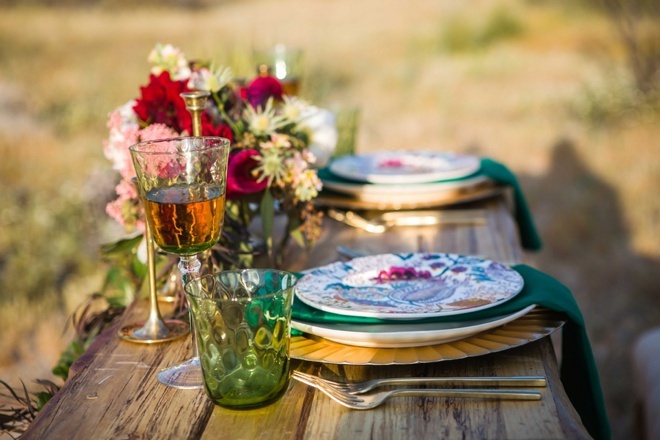 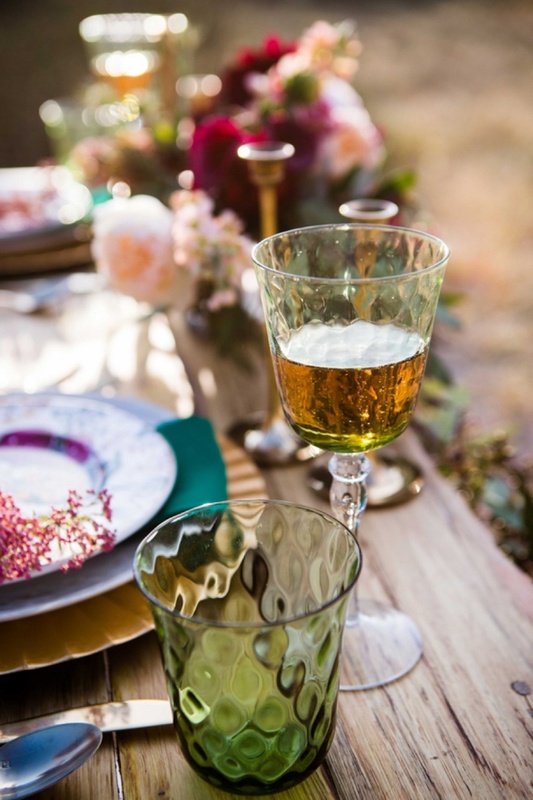 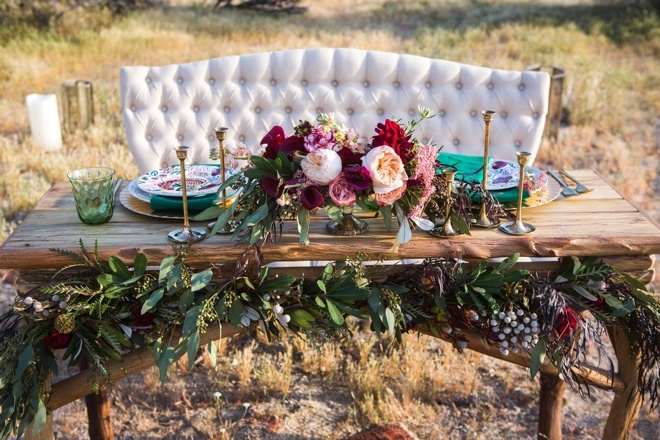 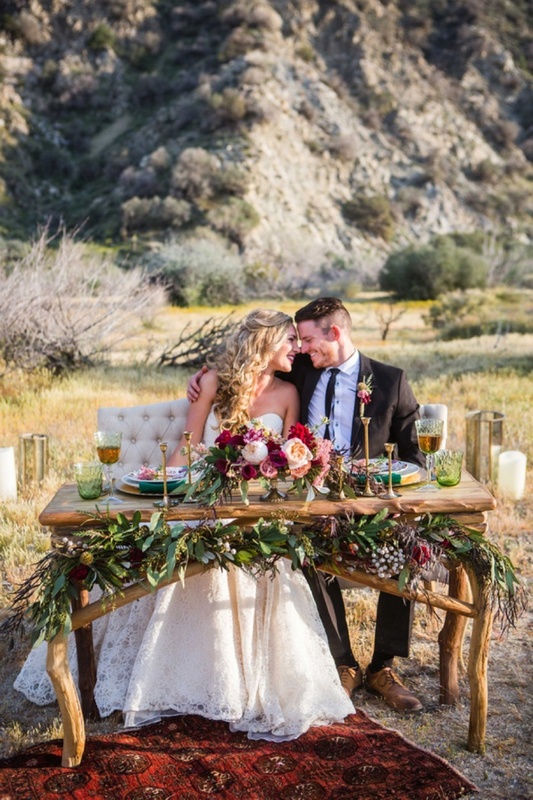 The reception sight stood out from its desert background with its vintage love seat, beautifully crafted wooden sweetheart table, green and gold tableware, a bohemian rug, and candles bringing life to the setting. 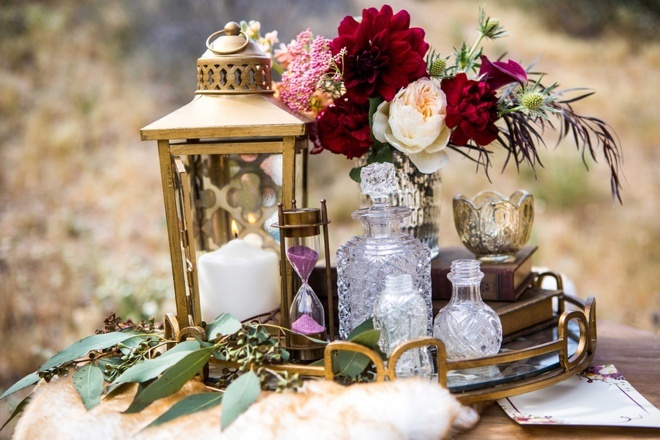 A beautiful garland of floral and greenery outlined the front of the table and a centerpiece of deep burgundy and pink pastels complimented the table. 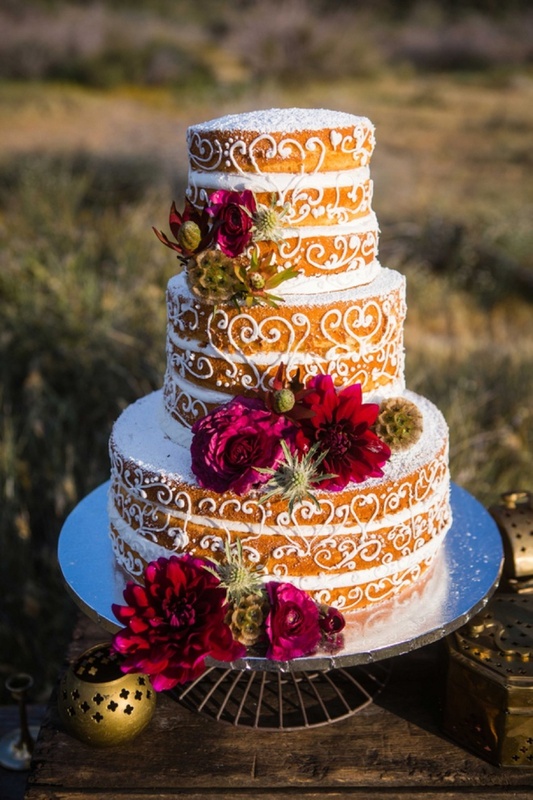 The cake table was adorned with a three-tear naked cake, brimming with frosted design and powder sugar, provided by Amazing Cake Creations. 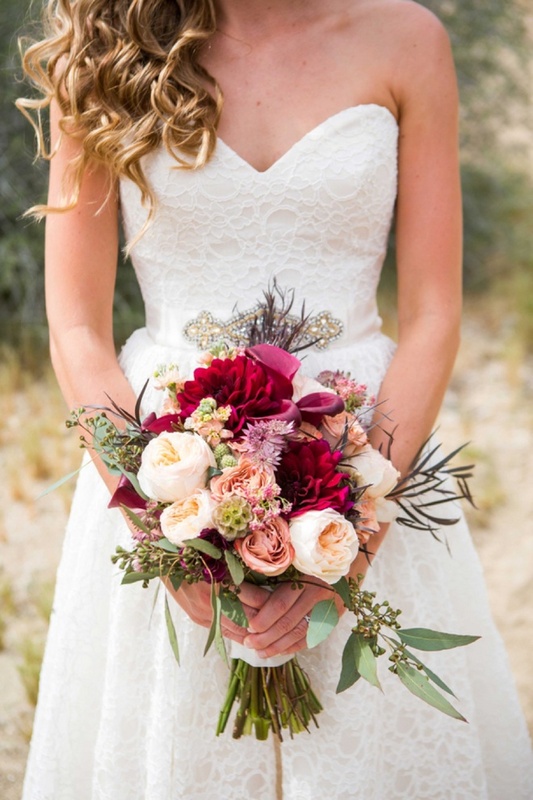 Floral added in the touches of color to complete this beautiful work. 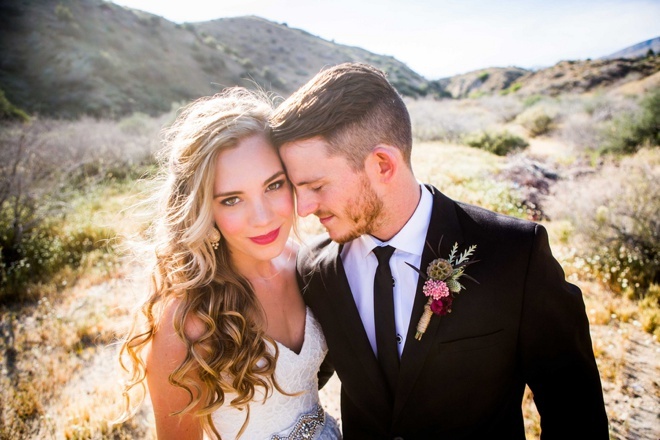 For our inspiration shoot models, we used one of my previous wedding couples. 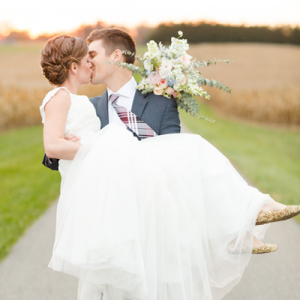 Jon (the groom) and Kelsey (the bride) were coming up on their one-year wedding anniversary. 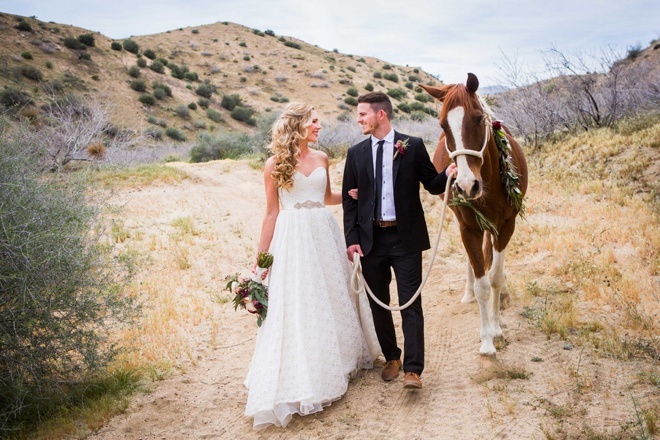 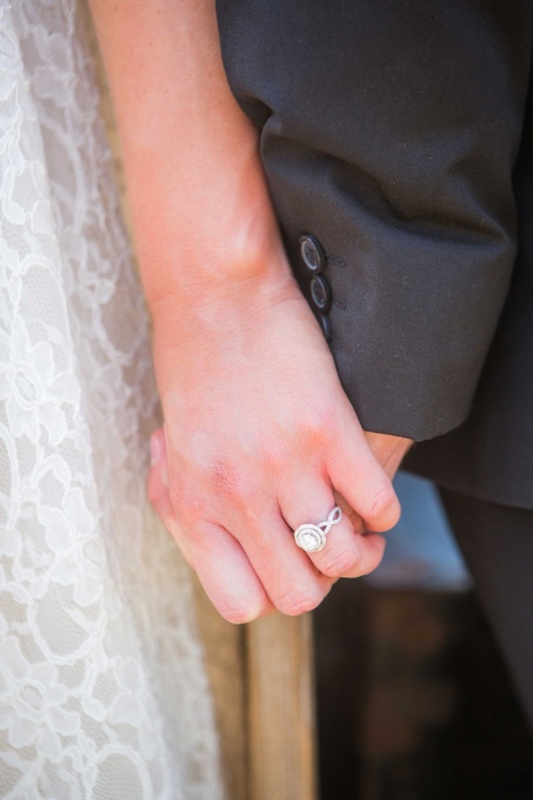 They were ecstatic to dress up again in their wedding clothes and take even more photos! 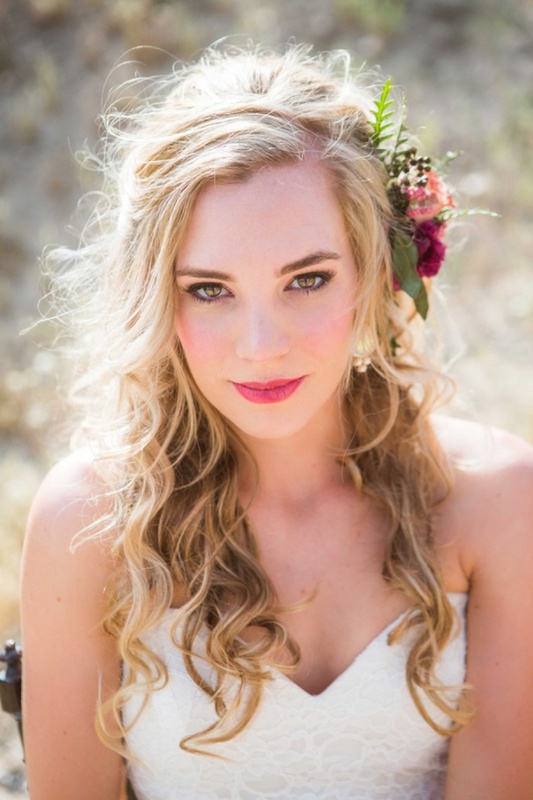 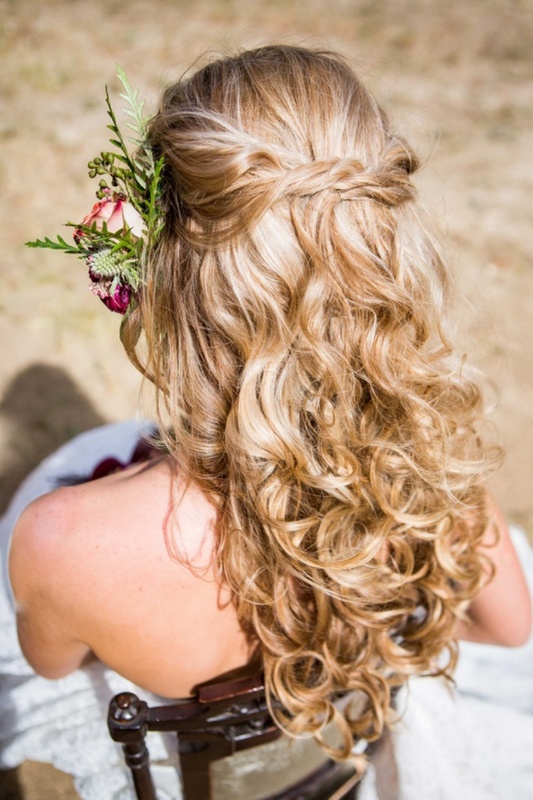 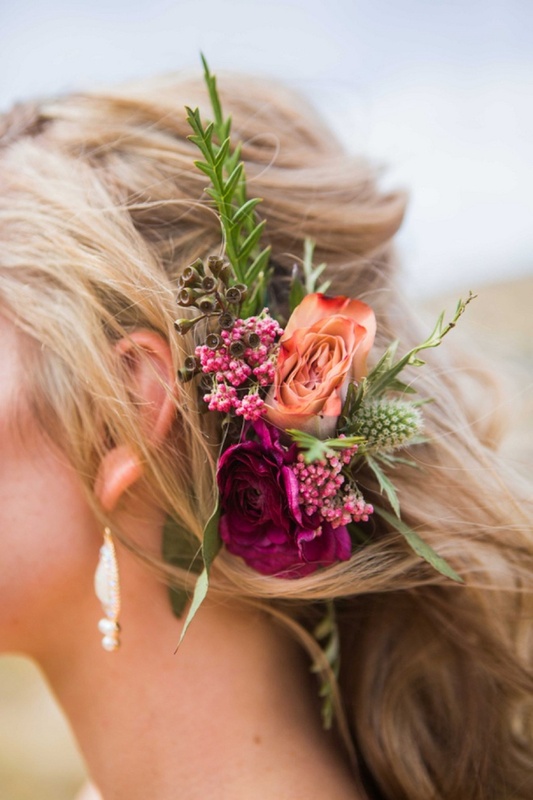 Kelsey looked gorgeous with her hair in a stylish half-up half-down do by Dianna Stolpp, of Bella Artistry, and a flower piece was provided by Jessica to compliment her already stunning blonde hair. 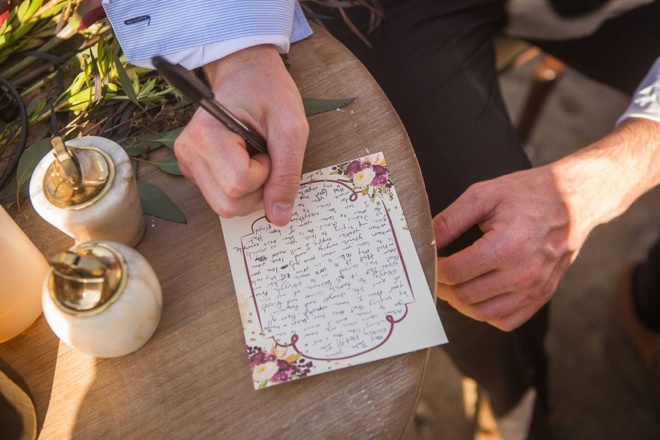 Cassie had them write real notes to one another for their anniversary and read them on opposite sides of the getting ready divider. 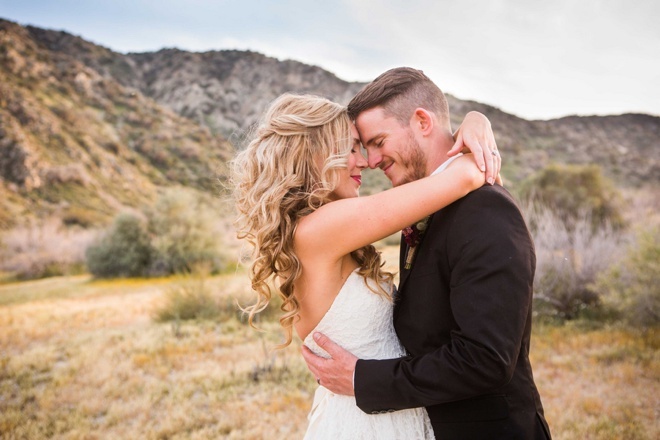 The smiles from Jon and the tears from Kelsey made for a beautiful moment amidst our shoot. 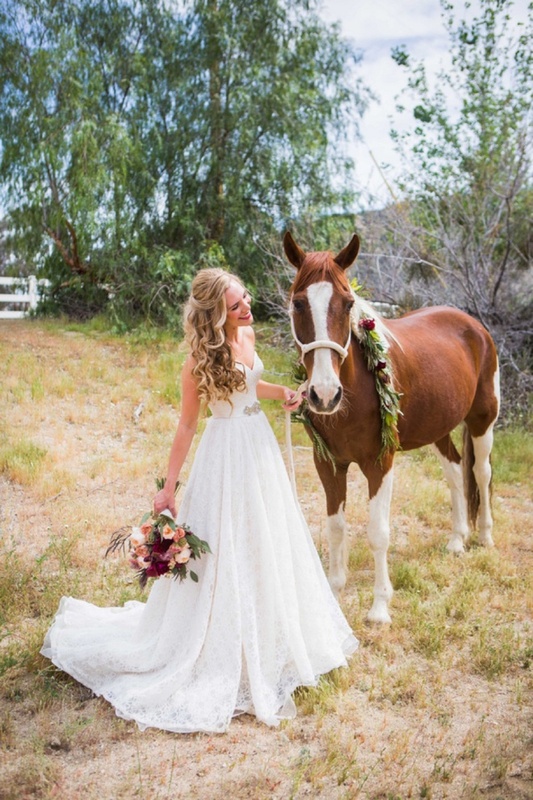 Kelsey had also told me before how much she wanted to have photos of her in her wedding dress with a horse, and we decided to make that a reality for her. 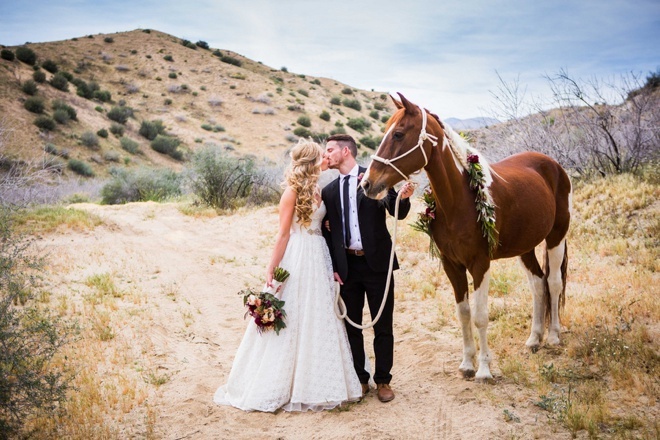 Cassie found the venue CottonWood Canyon Ranch and it was on their property and with one of their horses that the shoot commenced. 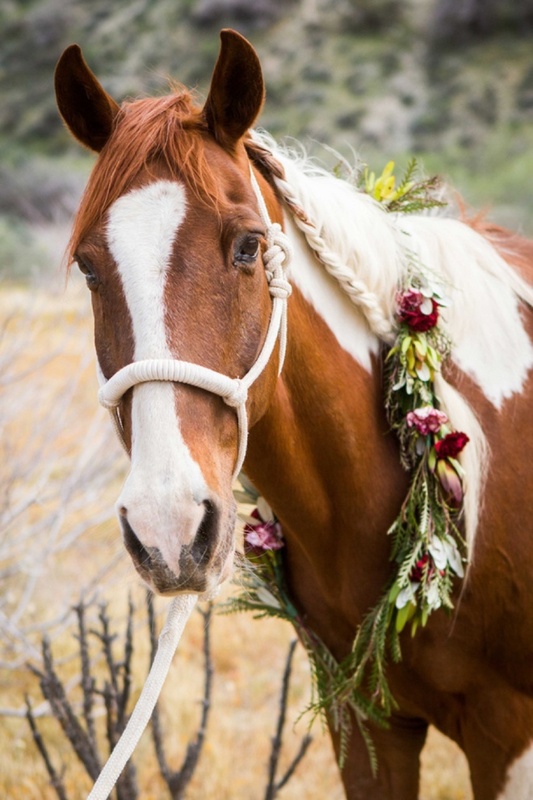 Jessica made a beautiful garland so that the horse, Toby, would look like the champion that he was! 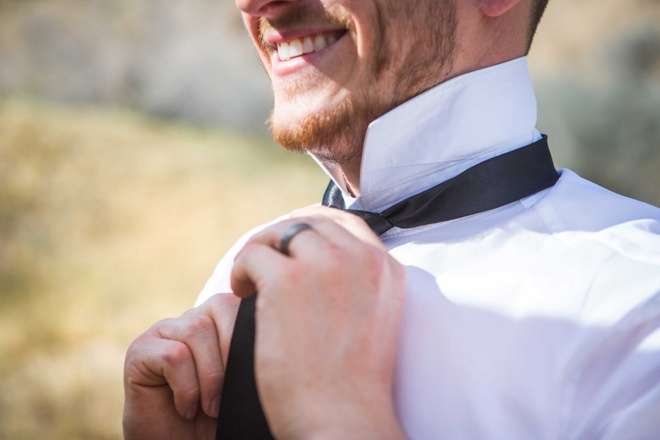 Toby brought a lot of laughter and fun to the shoot as we worked to keep him entertained for the photos. 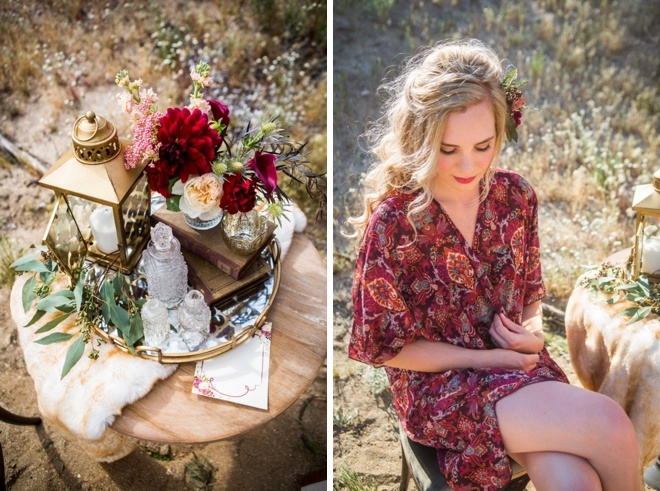 We started the shoot in the afternoon and went through sunset into the night. 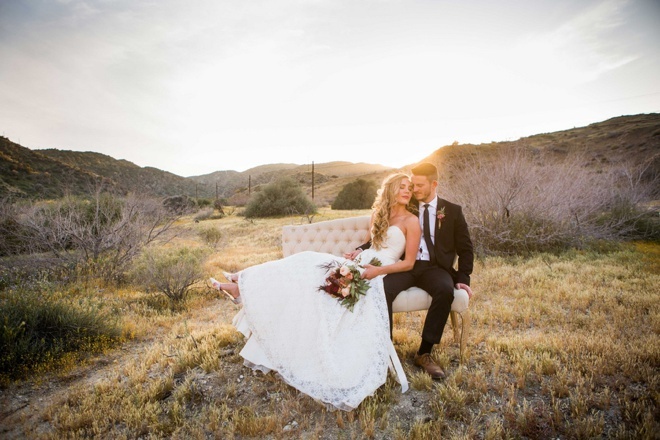 The warm tones of the desert and the golden light of sunset perfectly completed the look we were going for. 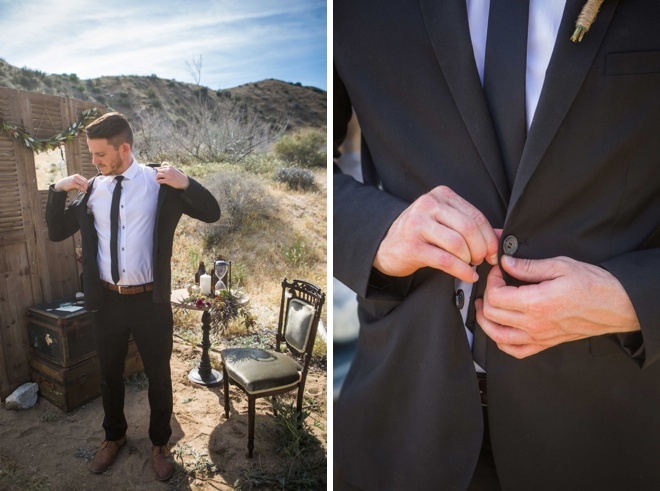 Our shoot finished in Joshua Tree National Park under a blanket of stars. 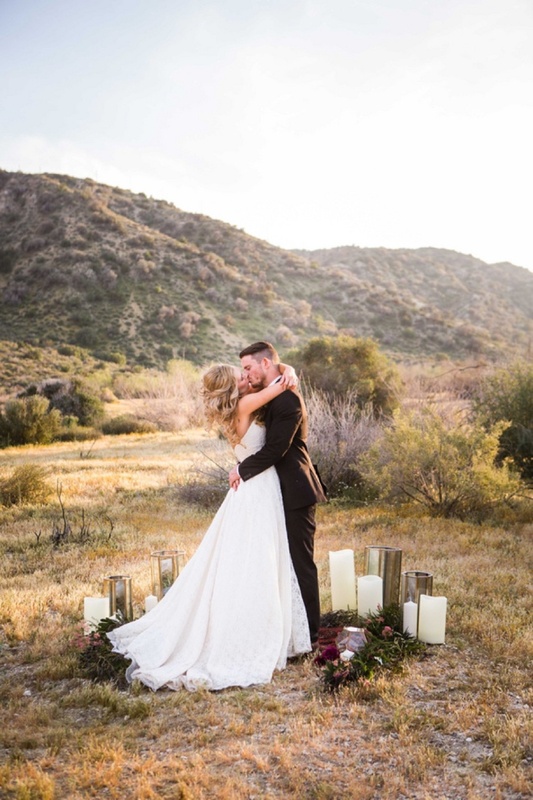 Jon and Kelsey were able to cuddle close together as the moon and stars shone around them, and brought the end to a perfect day of reliving their wedding!